This morning, local elected officials and federal administrators joined together to announce that Metro’s Regional Connector is now fully funded. The Federal Transit Administration (FTA) is granting $670 million in New Starts funding to the Regional Connector, and also extending a low-interest TIFIA (Transportation Infrastructure Finance and Innovation Act) loan of $160 million. A document showing how the Connector is funded can be found at the bottom of this article. While the Regional Connector announcement had been tipped in this morning’s Los Angeles Times, the surprise announcement is that the FTA hinted that it would also fund the pending request for $1.2 billion for the Purple Line subway. Streetsblog frequent readers may be very well aware of the Regional Connector. What follows is a three paragraph summary of the project and its timeline. If you’re already familiar with the project, skip ahead for today’s news, right after the page jump. The Regional Connector is a $1.4 billion 1.9-mile light rail subway. It will extend from the Little Tokyo Gold Line Station west under 2nd Street to Bunker Hill, then south under Flower Street to the 7th Street Station. What best explains the Regional Connector’s importance is that it’s light rail. Yes – underground light rail. From downtown, Metro has light rail running north (Pasadena Gold Line), south (Blue Line), east (Gold Line Eastside Extension) and west (Expo Line), but there’s no connection in the middle. Today, to get from one of these lines to another, one has to take the heavy rail Red/Purple Line subway. The Regional Connector closes downtown’s light rail gap, hence makes a lot of connections a lot easier. When the Connector is complete, today’s 3-4 rail lines consolidate down to just two. There will the combined Gold-Expo line extending from East L.A. to Santa Monica, and the combined Blue-Gold line extending from Long Beach to Azusa. The Regional Connector was funded under Measure R, with additional monies from State propositions 1A and 1B. Metro proposed a route alignment in 2010. Metro released its environmental review documentation in early 2012. Though some downtown and Little Tokyo interests opposed the project due to construction headaches, Metro approved environmental documentation in April 2012. For the start of today’s press event, elected officials boarded the Metro Gold Line at Union Station, and rode the train one stop to the Little Tokyo station, which is the spot where the future Regional Connector will join the existing Gold Line. Next, FTA Deputy Administrator Therese W. McMillan took the podium making the announcement that received the most applause. Though she mostly touted the federal role in funding nearly half of the cost of the Regional Connector resulting in today’s Full Funding Grant Agreement (FFGA), she closed by somewhat ambiguously stating that the Purple Line Westside Subway Extension “is up next.” This appears to acknowledge that the FTA would also be granting Metro’s application for $1.2 billion for extending heavy rail to the Westside. There was no conclusive confirmation of her remarks, so that story will have to wait until it’s made official. U.S. Senator Dianne Feinstein, and Congressmembers Xavier Becerra and Lucille Roybal-Allard subsequently promoted the importance of the connector’s seamless connections, job creation, and transportation benefits. Construction for the Regional Connector is projected to begin in late 2014, and, if all goes well, Streetsblog will cover its grand opening in 2020. Hopefully the lines will be renamed to a letter-based scheme by opening day. 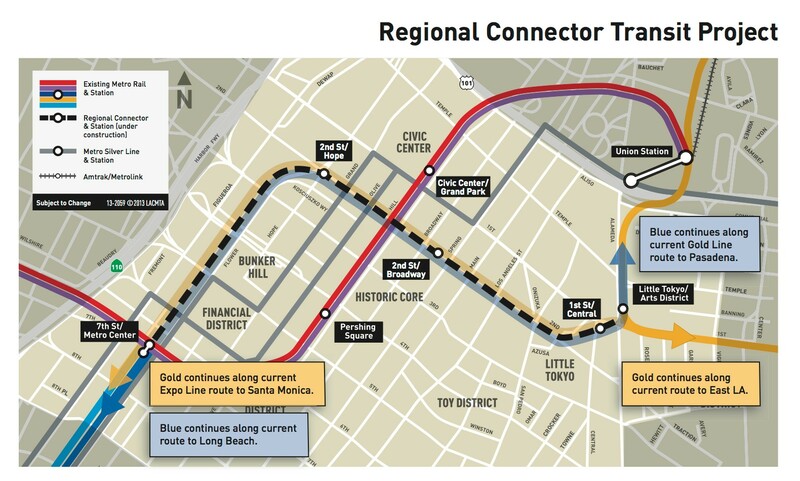 The reference to the “old Gold Line” versus the “new Gold Line” will confuse Metro users for years after the debut. My hope is that the “E” that has appeared on the Expo Line signage is a sign of things to come! There’s been quite a bit of speculation on just how the trains will be routed once the line is opened for service. One school of thought thinks it will be Azusa/ Pasadena to Long Beach, and East LA to Santa Monica, and other combinations have been proposed. Metro has a few years to figure it out. Ugh, anything but the letter-based scheme that NYC has. The map will need colors. There’s no need to even refer to “the Old Gold Line” except for history buffs. Just do a little PR work and advertising; people will get the idea. I think it would be useful to start thinking of the colors as lines, not routes. Keep the Gold Line going from SGV to East LA, but extend the Blue Line north and extend the Expo Line East. There’s no reason LA can’t run multiple lines on the same track, much the same way BART is able to in San Francisco. 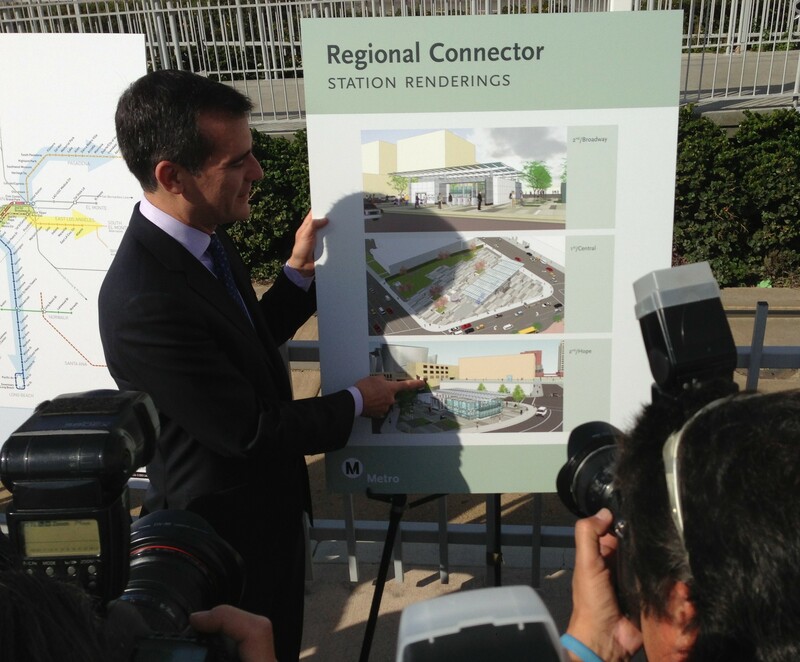 As LA’s rail infrastructure get built up, it will be a great way to maximize efficiency on existing track. NYC folks require such remedial naming. In LA we can handle different colors okay — even if they’re changing on us. We can handle it. Metro is already moving away from line names based on colors and I don’t see that changing. (The need to move away from colors has already been discussed in Metro Board meetings.) Of course colored lines would still be used on the maps, but I don’t think they will continue to be the primary naming scheme of the rail (or busway?) lines. A letter-based naming scheme is cleaner (unlike Metro’s current “mostly-colors-but-one-street-nickname” naming convention) has fewer ADA issues and racial overtones, and can accommodate up to 26 lines, which will certainly cover the system’s growth for the foreseeable future. But for those of you who don’t like letters, stress not! I doubt any renaming would occur before the Regional Connector opens. Let’s get the tracks built first, then we can worry about the line designation methods. Thanks! Just being silly — good information though — much appreciated. Actually Sam there is nothing preventing a Santa Monica-Azusa and East LA-Long Beach operation. I confirmed that in my comments on the Regional Connector EIR. http://media.metro.net/projects_studies/connector/images/Final_EIR/volume_f-3_responses_to_comments_on_the_draft_eis_eir_part5_of_6.pdf While Metro’s opinion is that there are more travelers headed in those directions, in practice I don’t think it really matters as there are likely the same number of people headed from, say, Highland Park to South Central as they are headed to Culver City. The projection is that the Long Beach and Santa Monica branches will do gangbusters, but the Pasadena-Azusa branch and the East LA branch will likely be weaker. You don’t really want to mix trains for operational reasons, but there is nothing stopping a Gold Line train from changing to a Blue Line train downtown. I could see this happening after Rose Parades, for instance.